I can’t figure out where to put my rubbish. Before I moved in, I casually asked my letting agent as we were walking to the flat, and he pointed out an alley way. He told me to just put it in there, which seemed a bit strange to me. Not sure about the alley way situation, I decided to email the council. They replied promptly and politely, and informed me that I should have a wheelie bin. They also told me that if I put my rubbish in the alley way it could be considered fly-tipping. I have no wheelie bin. I’ve looked around, and there isn’t even a place where wheelie bins for the five flats in this building could be. 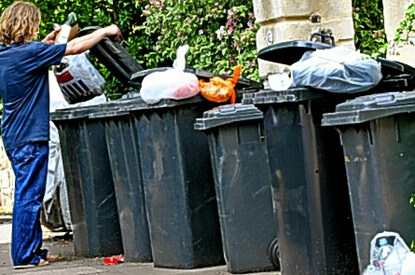 What’s more, the council website says that waste is collected every two weeks. So, does that mean I am supposed to store up my rubbish in my teeny tiny kitchen for two whole weeks until I can run outside and dump it in the alley way? If I dump it in the alley way before it’s due to be collected, foxes will probably open it up all over the street. The council did very kindly provide me with a phone number which I could call to order a new wheelie bin. However, even if I did decide to splash out £15 for a bin, I would still be stuck for somewhere to put it. On another rubbish-related point, I also asked the council what I should do about recycling. I was informed that, as I live in a flat, I am “not required to recycle“. This was quite a shock to me. I thought we were supposed to be upping our environmental-consciousness and recycling more. I had already started separating out my paper from plastic, but no one cares – because I’m living in a flat. Has anyone else in London experienced a similar problem? Can anyone offer a solution? Which council area do you live in? That sounds really awful. I live in a house with 8 flats and there are about 6 bins outside for normal garbage and then four green bins for everything that can be recycled. If they find recycables in the non recycable waste I think they can even fine us. But even if I wouldn’t use that there are garbage areas around the corners where you can recycle everything. Just not normal waste. Did you knock on your neighbours’ doors and ask them about it? I’m in Harrow. It;s really rubbish,isn’t it?